The Centre de danse du Marais founded by Michèle Carrance, lies within a U-shaped complex of three buildings. It is amongst the very few dance studios in Western Europe to be located in a listed building under a preservation order (classé à l’Inventaire des monuments historiques). 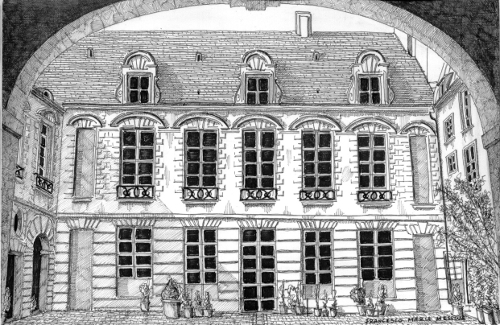 The main building as well as the South wing (to the left as one enters from the street) were built by the financier Guichard Faure, Sieur du Champ-de-Mars, very early in the Sixteenth Century. At his death in 1636, the Hôtel went to his son Nicolas, Sieur de Berlize, who enlarged it, and bought a large lot on the rue du Temple. At the latter’s death, the Hôtel de Berlize was sold to Claude Robert, Prosecutor at the Châtelet, and remained in the family until the Revolution. Sold yet again, the Hôtel was then split up. However, in 1835 a tradesman by name of Blézieux purchased the entire complex for his own use. The Hôtel does not actually face directly onto the rue du Temple itself (a very ancient street formerly known as rue Pierre Aulart). One enters it through a short driveway, paved with great stones and bordered by two small dwellings on either side. The right-hand dwelling has kept its fine wooden staircase with a turned balustrade. At the bottom of the courtyard, the main building, as well as the left wing, both built in the early Sixteenth Century, present stone quoins at the windows and a steep-sided slate roof. In the same style, the entrance wing is due to work put in by Nicolas Faure circa 1640. As for the right wing, lighted by plain, high windows, it is later in style. Although mutilated in the Nineteenth Century, it has nonetheless kept a small wrought-iron Louis XIV staircase. Directly opposite, in the left wing, one finds a grand staircase, two arcades in breadth, almost certainly rebuilt in the early Eighteenth Century. The first floor (mezzanine or étage noble) of the main building is made up of two very large rooms that boast intact Louis XIII painted ceilings - rediscovered only in 1971! The beams and joists and short-legs of the ceiling in the largest of the two rooms (the Salle Beethoven where the Nuits Blanches du Centre de danse du Marais were held), is entirely painted. One notes an interlaced M, being the monogramme of the Sieur de Montmagny, who is thought to have commissioned the decor between 1630 and 1640. In the smaller of the two rooms, vividly-painted iris, old-rose, poppy and lily flourish on the joists. Having been covered for so many years by a false ceiling, their colours are still bright; a few traces of early 19th Century decor persist as well. Facing out at 6 rue Pierre au Lard, what was formerly a garden-shed with an umbrella-shaped frame, is now the Café de la Gare; it still has its carriage gates and iron slamming-posts. With thanks to Alexandre Gady for allowing us to take this information from his book, Le Marais. Guide historique et architectural. Ed. Carré, 1994. Mr. Gady now chairs the Société pour la protection des paysages et de l’esthétique de la France.